The Riddle of the Sands, written by Erskine Childers and published in 1903 is the prototype of all modern spy novels. Arguably, the only earlier spy novels are The Spy, written by Fenimore Cooper during the American Revolutionary War and perhaps Kim by Rudyard Kipling. The Riddle of the Sands set a format and tone for spy thrillers that is still followed by many popular authors. When an amateur British sailor on a yachting holiday in the Baltic stumbles upon a German invasion plan masterminded by a renegade Englishman, he must choose between warning his country and his love for the traitor’s daughter. Carruthers, a British Foreign Office employee, agrees to go on a yachting holiday with an acquaintance, Davies. Carruthers assumes that Davies’ yacht, Ducibella, will be a luxury vessel with a crew. So, when he arrives at the port to meet Davies, he’s disappointed to discover that actually she’s a small sailing boat. Nevertheless, the two sail across the North Sea and into the Baltic, heading for the Frisian Islands, off the coast of Germany. Carruthers has to learn quickly how to sail the small boat. As they travel, Davies tells Carruthers the story of his earlier expedition to the Frisian Islands. Ducibella was nearly wrecked by a German yacht that lured Davies on to a shoal in rough weather. Davies is suspicious about what would motivate the Germans to try to kill him. Having failed to interest anyone in the government in the incident, he feels it is his patriotic duty to investigate further. Carruthers and Davies arrive off the Frisian Islands and explore the shallow tidal waters of the area. They discover nothing suspicious. The only rumour is of a secret treasure being recovered on a small island called Memmert. An expatriate Englishman, Dollmann, is involved. Davies falls in love with Dollmann’s daughter, Clara. Although suspicious of Dollmann, he wants to avoid hurting Clara. Carruthers and Davies try to approach Memmert. They’re warned away by a German navy patrol boat, the Blitz and its commander Von Bruning. This makes them all the more sure that there is something more than a treasure dig on the island. Taking advantage of a thick fog, they navigate the Ducibella’s dinghy through the treacherous sands to the island. Carruthers investigates the island. He overhears Von Brunning and Dollmann discussing something more than treasure hunting, including cryptic references to ‘Chatham’, ‘Seven’ and ‘the tide serving’. The pair return through the fog to Ducibella. There, they find Dollmann and Von Bruning have beaten them and are nosing around. Von Brunning invites them to his villa for a dinner, but is obviously suspicious. At the dinner he attempts to subtly cross-examine them to find out if they are British spies. Carruthers plays a dangerous game, admitting they are curious. But he convinces Von Bruning he believes the cover story about treasure and merely wants to see the imaginary ‘wreck’. In The Riddle of the Sands, Erskine Childers combined the subgenres of Adventure Novel, and Invasion Story, which had been popular for years and invented the modern spy story. Active protagonists who make things happen. Patriotism or other simple motivations. External rather than internal conflict. Exciting set-piece scenes of conflict. Unlikable antagonists with nefarious motives. Lots of procedural and technical detail. 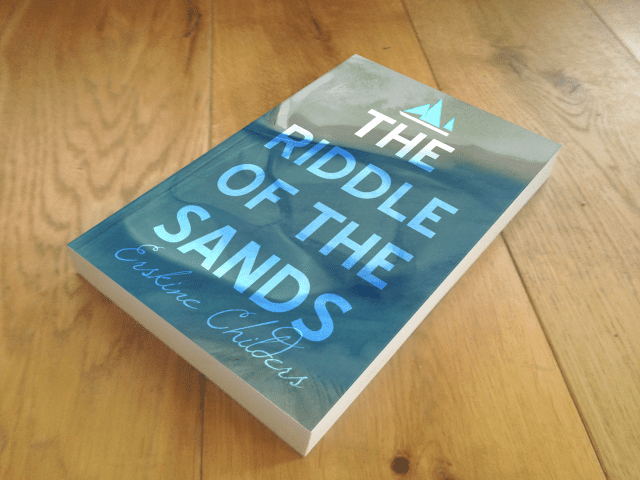 The Riddle of the Sands has a hybrid of Adventure and Mystery plots (see Spy Novel Plots). It’s a curious book for the modern reader: slow by the pulse-pounding thriller standards we are used to, but it holds the reader’s interest nevertheless. One strand is simply a sailing adventure story. The other strand is the mystery and this does build nicely. Davies’ obsessive need to discover the secret of the island and Carruthers’ more languid interest contrasting nicely. Surprisingly much of the story does not feel that dated, perhaps because of the sailing element. Sailing has not changed much. The characters seem rather reserved, and their patriotism certainly exceeds the usual level in Britain these days. The romance between Davies and Clara is also rather coy by modern standards, with little more than a few batted eyelashes between the supposed lovers. The only other spy novel I’d argue has been as influential as The Riddle of the Sands is The Thirty-Nine Steps, which introduced the spy as a fantasy hero, battling impossible odds and always in danger. There’s none of that in The Riddle of the Sands; it’s realism quotient is high, particularly the sailing sequences. In fact, large chunks of the novel are almost verbatim from the logbook of one of Erskine Childers’ sailing holidays in the Baltic. It’s interesting to note that the ‘spymania’ that resulted from Erskine Childers’ The Riddle of the Sands and a flurry of similar books from authors like E. Phillips Oppenheim and William Le Queux, actually predated the modern intelligence agencies. In fact, the scaremongering of Le Queux in particular was directly responsible for the creation of Britain’s intelligence agencies. 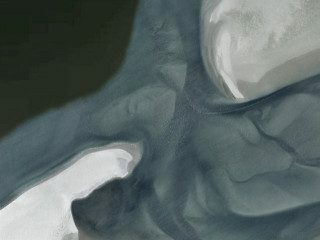 I was inspired by the abstract patterns of water and sandbanks surrounding the Baltic island at the heart of the mystery. The cover image superimposes the title in simple, bold lettering and Erskine Childers’ name in a flowery script. It’s a simple, minimalist cover that hints at the sailing theme with the icon of the yacht leading the eye to the title. Builds a fascinating portrait of a world that no longer exists. Treat it as a period piece and make a few allowances for the style of a bygone era and it will pay dividends. There was a movie of The Riddle of the Sands made in the seventies starring Michael York, Jenny Agutter and Simon McCorkindale, but it’s probably best forgotten. Stick with the book. It’s available for free on Project Gutenberg. If you’d like to discuss anything in my The Riddle of the Sands review, please email me. If you thought it was good then please share it using the buttons below.